A fell runner has plunged more than 100ft (30m) down a mountain in the Lake District. The man, in his 40s, from Otley, West Yorkshire, was seriously injured when he fell from Scafell Pike on Saturday. He was winched off the mountain by a Sea King helicopter crew and flown to the valley floor. He was then transferred to another helicopter and flown to Newcastle's Royal Victoria Infirmary. Rescuers said he suffered multiple injuries. 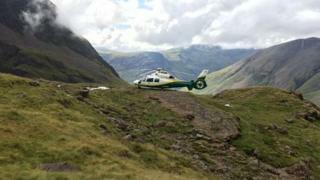 A spokesman for the Wasdale Mountain Mountain Rescue team said the man was in a stable condition. The Great North's Air Ambulance The Pride Of Cumbria, based at Langwaithby, near Penrith, was also involved in the rescue.